Navy Crew-neck Sweater by A.P.C. 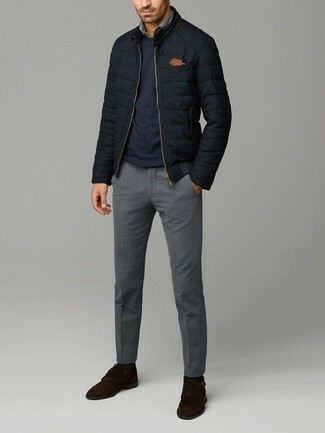 If you're hunting for a casual yet stylish getup, try teaming an A.P.C. logo merino wool sweater with tobacco chinos. Both items are totally comfortable and will look great together. To add elegance to your getup, complement with brown leather casual boots. 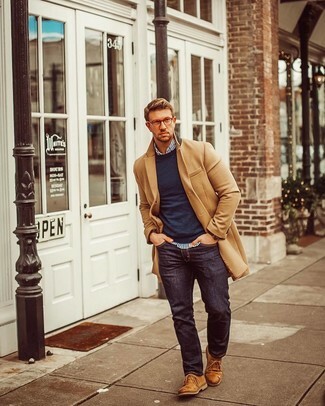 If you feel more confident wearing something functional, you'll love this seriously stylish pairing of a navy crew-neck sweater and navy chinos. Puzzled as to how to finish your outfit? Rock a pair of brown leather casual boots to kick it up. If you're searching for a casual yet stylish look, wear a navy crew-neck sweater and navy jeans. Both garments are totally comfortable and will look great together. Bump up the cool of your look by wearing black and white leather derby shoes. 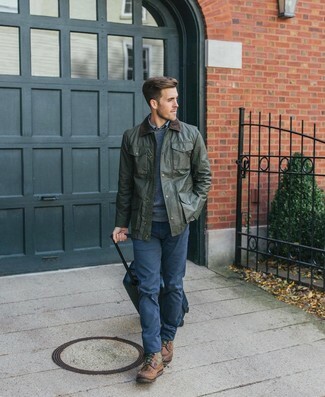 Consider pairing an A.P.C. 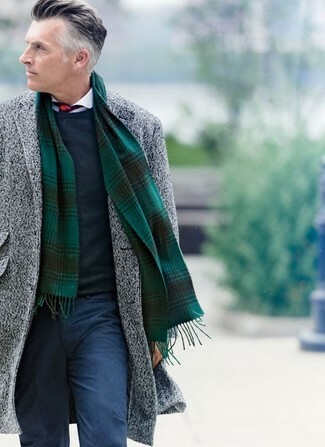 logo merino wool sweater from Nordstrom with grey dress pants for incredibly stylish attire. Let's make a bit more effort now and make black leather oxford shoes your footwear choice. You'll be surprised at how super easy it is for any guy to get dressed like this. Just an A.P.C. 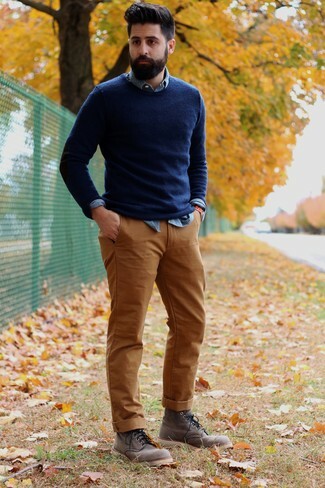 navy crew-neck sweater and navy jeans. Let your styling sensibilities really shine by finishing off this look with tobacco suede desert boots. If you're on a mission for a casual yet stylish ensemble, consider pairing an A.P.C. logo merino wool sweater with navy chinos. Both garments are totally comfortable and will look great paired together. Turn your sartorial beast mode on and throw in a pair of brown leather derby shoes. For a nothing less than incredibly stylish outfit, consider pairing an A.P.C. logo merino wool sweater from Nordstrom with navy wool dress pants. If you're on a mission for a casual yet stylish getup, rock a navy crew-neck sweater with blue jeans. Both garments are totally comfortable and will look great together. 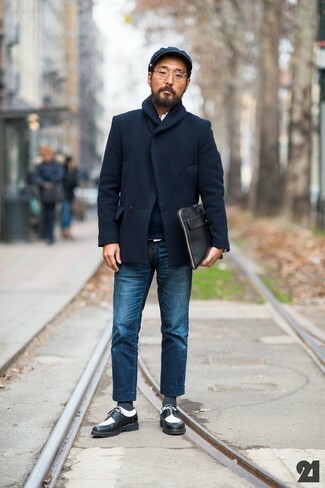 Pair an A.P.C. logo merino wool sweater from Nordstrom with grey wool dress pants for a classic and refined silhouette. When it comes to shoes, this getup pairs wonderfully with dark brown suede double monks.